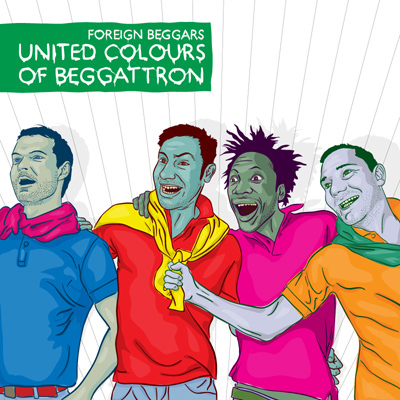 Last week saw the release of the brand new Foreign Beggars album titled ‘United Colours of Beggattron’. Once again the Beggar fam’ kill it like no other crew in the UK, serious beats and serious rhymes makes this album worth a listen. This time around we are exposed to a fresh mix of production coming from Noisia, the beats are raw, fun and will have you bouncing. As always the lyrical content is relevant, sharp witted and delivered with verbal swagger. Here’s the video for the track ‘Contact’ taken from the album. The album ‘United Colours of Beggattron’ is out now on Dented Records. If you like what you hear and want to know more or get you hands on the album, be sure to check out Dented Records.